This could be read a couple of different ways today. When I do readings for others, I explain that inverted cards could have varied interpretations. Either the energy is just beginning to manifest or is on its way out (reversed indicating a lesser energy, not currently at its peak), or that some of the more “negative” qualities of the card may be active at the present time. I don’t like using the word “negative”, but I’ve yet to find a more suitable word. What I mean by it is that, for example, one card may indicate strength, courage, determination, and will power on one hand, but on the other hand can indicate stubborness, arrogance, and being bull-headed. The upright position would indicate healthy doses of strength, courage, determination, etc. The reversed position would caution against arrogance, stubborness, etc. However, the other way this card could be interpreted as reversed would indicate an emotional upset, emotional instability, lack of faith regarding emotional well-being. Considering my current state and recent writings/reflections, I’d say it could actually mean BOTH! I’ve been in a bit of an emotional upheaval, most specifically related to the situation with my current Romantic Partner, which this card is coupled with this morning. It hasn’t been a depression or a major sense of sadness, but there has been work done by me in regard to keeping my emotions contained, drawn back, leashed, or – as I’d comfortably learned to describe it, “reserved”. However, there’s the chance that this process is one of healing, that the issues on the table are like “clogs” that need cleared – and once cleared, could lead to that emotional bliss of the upright Ace of Cups. Cups represent emotion and planning. They represent how we feel, or we want in terms of feelings. It’s an ocean of feeling and emotions. Cups are the realm of heart and soul. Aces represent raw, untapped energy, or the best that the suit has to offer. 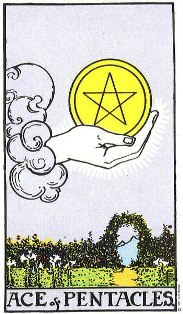 The Aces show a divine hand guiding the path, or making an offering. I call the Aces “Gifts from God”, even though I define God differently than most. Long story short: I’ve been on a bit of an emotional roller coaster, but I’ve been diligently working on restoring balance and developing a healthy outlook and positive state of mind regarding feelings, emotions, love, and romance. Karma and Consequence (of the good kind) may see to it that this work pays off by way of divine happiness. Trust that the path toward the heart is correct for you..
Let’s see what the other sources say. The Ace of Cups shows is a symbol of possibility in the area of deep feelings, intimacy, attunement, compassion and love. In readings, it shows that a seed of emotional awareness has been planted in your life although you may not yet recognize it. When the seed sprouts, it could take almost any form. It might be an attraction, strong feeling, intuitive knowing, or sympathetic reaction. On the outside, it could be an offer, gift, opportunity, encounter or synchronistic event. When you see this Ace, examine your life to see how its loving energy could work for you. This card often means that love is the essence of the situation. It may or may not be romantic love. Look for ways in which you can begin to connect with others. Do you have someone to forgive, or do you want to ask for forgiveness? Can you set aside your anger and find peace? Would you like to drop your reserve and let your feelings show? The Ace of Cups tells you that your time is coming. This card also suggests inner attunement and spirituality. Cups are the suit of the heart, and the Ace stands for the direct knowing that comes from the heart. Trust what your feelings are telling you. Seek out ways to explore your consciousness and your connections with Spirit. Allow the power of your emotions to guide you in a new direction. Embrace the love that is the Ace of Cups. Aces are the root force. They are the spark. Relate them to the Magician, who presents the tools to the Fool. They have no purpose yet, but are filled with raw potential. They are the active energy of the suit ready to be used. Emotions rising up for new love. This usually indicates that the querent is feeling a new welling of emotion or beginning to have some vivid dreams. They’re not writing the poetry yet, but they feel the desire to, or they may have caught sight of a figure across a room and felt a tug at their heart. They’ve lifted the cup and they want to drink from it. *NOTES: Notice how well this card synchronized with the Fairy Oracle, Romantic Partner? This is why I LOVE using these two decks together. I’ll also re-state that today is Friday, governed by Venus, the goddess of love – a day for love and romance. Another confirmation of why I indulge in the magick of daily correspondences!